Masters degree in jazz performance and composition is established in collaboration with the sound technologies graduate program. Its integrated and interdisciplinary curriculum is based on 3 subfields which have utmost importance for jazz music; performance, composition and music production. These 3 focal areas of the curriculum is designed to encourage creative thought, entrepreneurship and promote success in the current music industry. To this end, it is structured to provide a rich and valuable array of academic and music courses such as jazz composition and arrangement, advanced jazz harmony, music business, advanced recording techniques that prepare students for an ever-changing musical climate. The students go through an intensive period of advanced jazz theory, classic form, improvisation, composition and arrangement courses. The program provides performers with a solid musical foundation along with advanced performance training led by our world-class artist/faculty to develop their own individual voice and expression in music. They are offered direct and immediate interaction and performance opportunities with internationally acclaimed artists and educators as well as industry executives and entrepreneurs. Our curriculum led by a world-class faculty and location provide students with a unique opportunity to develop as performers, composers, instructors, arrangers, ethnomusicologists, music critics, film and commercial music producers and make the contacts necessary to launch a professional career in the globalized jazz world. One of the inherent characteristic of jazz is its everchanging capacity to transform and redefine itself harmonically and conceptually. Jazz also integrates into its embodiment the cultural heritages of the new geography it goes to; embracing its traditional sounds, dance rhythms and evolves into a new jazz form with defining cultural traits. 150 years of Jazz History are full of examples of this evolutionary process as illustrated in the Afro-american, Latin-american, Northern European, Indian, Russian, Turkish jazz music etc. 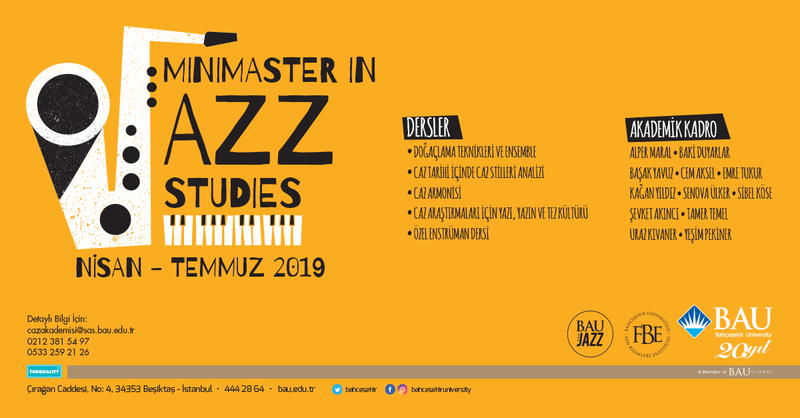 Adopting these inherent characteristics of Jazz as our primary goals, our program aims not only to provide students with general jazz theory and performance excellence but also endow them with jazz forms of our own geography within the Turkish musical heritage. Classical form is based on the relationship between classical music and jazz in terms of formal structures. Through study and analysis of musical examples and guided written work knowledge and skills are developed in certain formal concepts. Blues is one of the main foundations of jazz music and is indispensable for introducing students with its preliminary harmonic structure. This course enables students to understand and interpret the blues with feeling, and to apply its unique mood in a wide range of blues repertoire and improvisation. This course aims to analyze issues on copyright, management, media, social media, creating business opportunities, as well as cover up common issues that today’s musician is dealing with in the aim to created therefore. This course aims to introduce approaches to composition using ideas and aesthetic principles from a variety of non-Western musical traditions. Explorations of diverse concepts of rhythm, melody, timbre, and form as heard in the music of Africa, Asia, India, and South America. Assignments will include a substantial composition illustrating these fundamental music traditions from India to Africa, from South America to Chin. Furthermore, the regional musical instruments are going to be searched. At the end of the semester, each student is going to concentrate on a selected region and compose a piece inspired by that regions’ music. This course aims to cover up the theory and practice of songwriting. The craft of songwriting includes the subjects of melody, harmony, lyrics(both Turkish and English), song structure, rhyme types and prosody. In order to develop this craft, students are motivated to write songs through exercises and assignments, the selected of which will be presented at the of the course. This course will provide students with chronological study of jazz, with insightful commentaries on it’s origins, and full descriptions of the various styles of jazz and the personalities that have contributed to this innovative form of music. This study is a necessary foundation for students to analyse, connect and compare diferrent jazz styles within curicial periods of jazz history.It also gives students in-depth analysis of musicalelements such as jazz music forms and its technical appendices that discuss advanced music theory concepts.